The above is my official registered jeweller's hallmark. 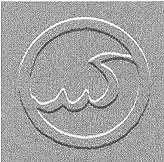 The design represents waves, as my business' legal registered name is From The Sea To Thee. What kind of name is this? Well, back in 1976, when I opened my jewelry shop, friends and I came up with this name. The Sea in the name refers to the Sea of Consciousness, where I supposed the designs I dreamed up came from. 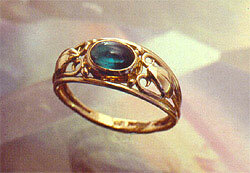 Tourmaline and 14kt gold openwork ring, with heart-shaped leaves growing up the sides. 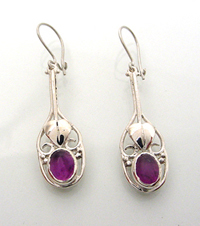 Also available with ruby or sapphire, garnet, opal, amethyst, onyx. 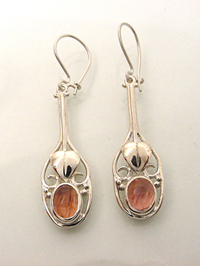 In sterling, with semi-precious stones, $175 ea., most finger sizes. First I made the Leaf Ring. 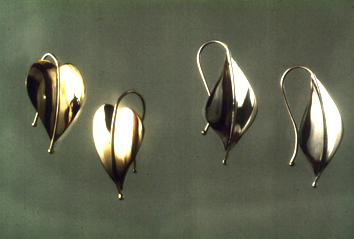 Then customers wanted Leaf Earrings, and so I came up with these, shown slightly larger than actual size. In sterling, they are $125 per pair. Gemstones shown are cognac quartz, green tourmaline, amethyst, and garnet. 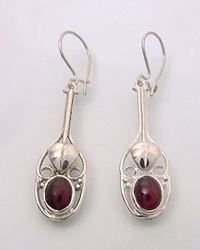 Leaves are natural forms that lend themselves easily to Jewelry. 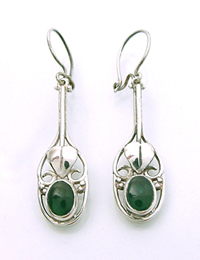 Here, the leaf stem becomes the earring wire for heart-shaped and pointed oval leaf earrings. In sterling, they are $55/pair. Please contact for current price in 14kt gold. 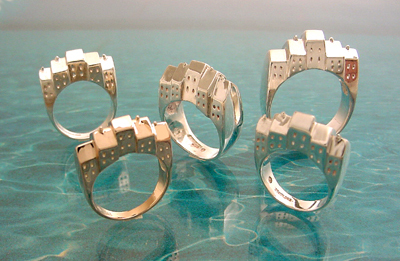 This ring whimsically portrays a row of houses complete with windows and chimneys inspired by old Montreal. A real conversation-starter, this ring seems to be a favourite of artists, architects, and real-estate agents. Women's sizes $175 ea., in sterling. A larger-proportioned model for men's sizes, at top right, is $225 in sterling. Also available in 14kt gold.